Phenomenal street food, atmospheric streets filled with heritage and a vibrant art scene, are but a few of the reasons why you should visit George Town, (a UNESCO World Heritage site since 2008), at least once in your lifetime. Named after King George III, the colonial-era capital is located in Penang, just off the coast in the northwestern part of Malaysia. What used to be an integral trading hub between East and West, this multicultural city is now known for its unique townscape of restored historical buildings, shophouses, temples and humble hawker stalls that blend past and present times. With so much to explore, we decided to hit the (George) town and took a direct flight from Hong Kong to discover the best places to stay, see, explore, eat and drink. 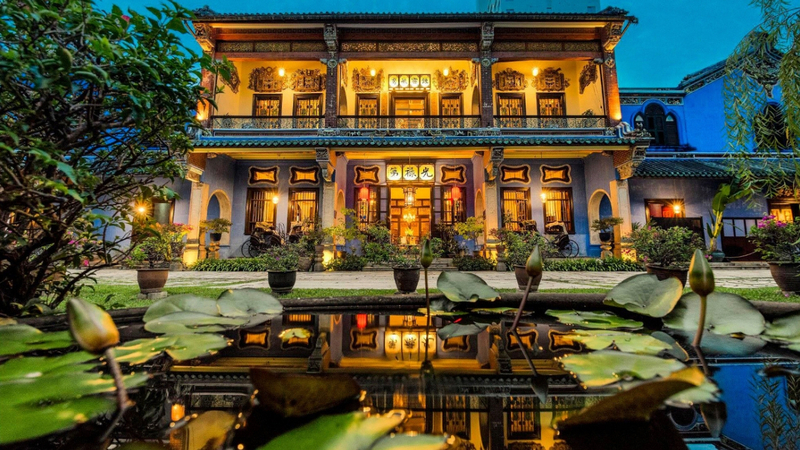 Cheong Fatt Tze Mansion, also known as The Blue Mansion — or in more recent times the courtyard setting where the pivotal mahjong scene in Crazy Rich Asian takes place, is one of George Town’s more prominent heritage buildings. The intriguing history behind Cheong Fatt Tze surrounds a true rags to riches story about a Chinese businessman of the same name. Make sure you join one of the daily tours to find out more about this 19th Century story where 45-minute tours are conducted in English, unless arranged prior to your visit. It’s also worth going in at the earlier time slot (11:00am) which is slightly cooler. The vibrant indigo walls provide a brilliant backdrop for photography too, so you’ll want to wear something other than blue so as to not blend in too well. Part of the Seven Terraces Hotel by award-winning hotelier Christopher Ong, Kebaya Dining Room is a restaurant serving a contemporary interpretation of Peranakan cuisine, which is a combination of Malaysian, Chinese and Indonesian influences. The celestial sounds coming from the live Gu Zheng (Chinese Zither) performance will reel you into a dining room filled with gorgeous antique furniture and marble-top tables, accented by vintage crockery in various shades. Expect food that is modern but based on the very best of traditional flavours, enhanced by the skills of Swiss-trained chefs Zac and Kent. A four-course meal offers a choice of appetiser, main course, greens and dessert. Our highlights included Otak Otak, which unlike the banana leaf wrap version, uses fresh local red snapper in a golden flaky pastry served with a rich yellow curry sauce; and Beef Tamarind, an incredibly tender, sweet, spicy and slightly sour dish cooked for 72 hours in sous vide. Wander around George Town and you will discover art and murals scattered along the streets and buildings. Although slightly washed out, the artwork is actually less than a decade old and started when the Penang State Government hosted a competition to breathe life back into the old town. This includes a collection of iron rod sculptures and caricatures to illustrate anecdotes of history as well as work by Lithuanian artist, Ernest Zacharevic. Inspired by the everyday lives of the locals, his work was created to encapsulate the spirit of the city, through quirky scenes that are both interactive and relatable. You will need to spend some time finding them all, but some of our favourites included; Little Girl in Blue along Muntri Street and The Boy with Pet Monster on Ahh Quee Street, both by Zacharevic, as well as the iron caricature on Leith Street by Baba Chuah which depicts the scene of a young man, by the name of Jimmy Choo, who had just started his apprenticeship in making shoes. Hidden bars and speakeasies are going from strength to strength in Asia and this is apparent in Penang also. Tucked away in the heart of George Town is Manchu, a Qing Dynasty-themed bar with staff dressed as Manchurians and Chinese opera singers (yes, with all the dramatic makeup and headgear) that perform on weekends. Lanterns, birdcages and parasols line the interior and the dimly lit atmosphere, steeped in red lighting, evokes a dangerous mood in which one might order a fair few cocktails to try. Highlights from the drinks list include the bright magenta cocktail Cinnabar Red, served in a geometric-orb with vodka and dragon fruit for a refreshing summer drink. The Whisky Sour however, was the favourite of the night with a balance of sweet and sour, enhanced by fragrant aromas from orange peel. Established in 1885 by the Sarkies brothers, best known for a chain of luxury hotels throughout Southeast Asia, The Eastern & Oriental Hotel is a large colonial-style hotel on the seafront in George Town. Thanks to some much needed restoration and reconstruction, the five-star hotel has been able to retain much of its old world character and opulence with a historical Heritage Wing and a new wing on the block, the Victory Annexe. For those who enjoy the elegance and charm of the British colonial era, the writers suite facing the courtyard is the one, whilst a spacious corner suite on the newer side holds a beautiful terrace overlooking the ocean. Guests have access to facilities in both wings which is equipped with two gyms, two pools, an award winning Pañpuri Organic Spa and much more. Don’t forget to get the most out of the extensive breakfast at Sarkies or for fellow sweet lovers, the macadamia and caramel cheesecake at Sarkies Corner is a real winner. Penang has the highest population density in Malaysia of which the ethnic majority (at seventy percent) are Chinese. So you are likely to be able to use your mandarin to get around, otherwise English is well-used, which is just as well as you’ll want to order one of the best known dishes in Penang — Asam Laksa. This popular rice noodle soup dish consists of poached mackerel in a spicy and sour broth made with tamarind, lemongrass, hot chillies and shrimp paste, and can be found by the roadside and in most restaurants.